Not once i had to stop a loop doing some processing after it was 30 mins in, and it was using transactions, and I hate pressing the red square button. I just hate that. Waiting for current command to be rolled back, rolling back any open transactions… Recently, when again i had to use a WHILE again, I started to ask myself how can I skip the red button if I need to stop the loop in the middle of it. Answer came pretty fast – use a global temp table to keep the flag into it, and when I need to stop it, just update the flag from a different session. And the actual loop. 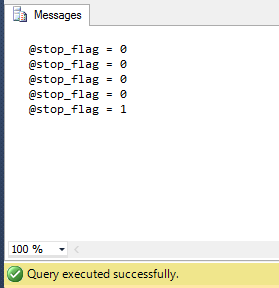 Before it starts, need to default the @status and @stop_flag, so that it enters the loop. In the loop, execute the temp procedure first, and take stop_flag value from global temp table. Ok, that’s nice, I’ve stopped my while loop when I needed, but it also completed current “step”, so I don’t have to worry about open transactions left over, I don’t have to wait for transaction to rollback – i just need to wait for it to complete, i didn’t had to push the red button, query says “Completed successfully”. I bet this can be done better, but for me, it served my needs when I needed. You can do this using a time limit too (personal implementation)..